Windows Service Monitor is one of the simplest IPHost Monitors. All it does is to check whether a given Windows service is run. Alert is raised if no defined service is currently on. Testing Windows service presence manually means running ‘net start’ command and parsing the results to detect whether the service in question is in the list; if not present, the service is stopped. Checking services might be useful to detect early possible system malfunction, out of resources conditions and so on. 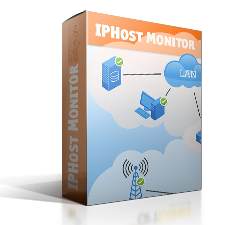 IPHost Network Monitor offers a simple means to run such tests easily. Creating Windows Service Monitor isn’t hard. Specify short service name (note: it can be seen in the properties of the service we plan to monitor, it’s different from the service’s display name). You can also specify required credentials (domain, user and password) if the default values (administrator’s credentials on local computer) will not do. Specify the polling interval and amount of service detection failure to be treated as an alert. Checking Windows service presence can help to detect problems resulting from important services stopped functioning. Any service running by default can cause system malfunctioning if stopped. E.g., if DNS client is stopped, domain names resolution stops, domain names won’t be recognized. W32Time service, if stopped, leads to time synchronization absence. It can result in miscellaneous problems if file timestamps are checked. 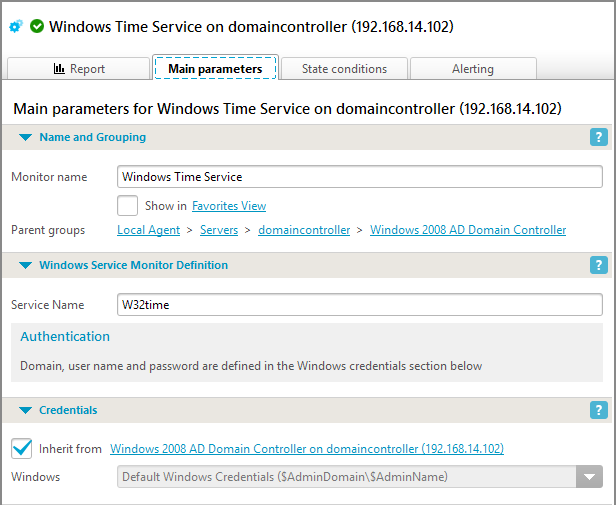 You can create separate monitors for each of Active Directory domain services on an AD Domain Controller. Thus, monitoring most important services can alert system administrators in time. 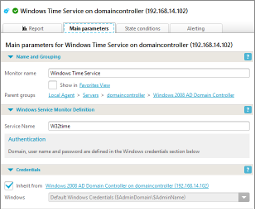 Windows Service Monitors can be used as dependency monitors for other monitor types. E.g., if MS SQL server service is stopped,the corresponding database monitor will go down; however Windows Service Monitor may execute quicker and prevent more resource-consuming checks returning the same result.